AIA KPOP Live in KL 2013 was organized in Malaysia in conjunction with AIA’s 65th business year in Malaysia was a successful event indeed. The event which was held in Stadium National Bukit Jalil was the first ever concert sponsored by a life insurance in the country. The concert was attended by over 12,000 AIA Malaysia employees, agency members, customers, business partners, media as well as K-POP fans for their 65 years anniversary. With the theme of “Be real. Love it. Live it”, the Cube Family managed to lift up the atmosphere as everybody really enjoyed the performance very much. With a great line-up from Beast, G.Na and 4Minute, all of them know how to entertain the fans with their great showmanship along with their hit songs. The concert started with Korean born-Canada, G.Na to open up the stage with ‘Supa Solo’ from her first album. The catchy music from the song did warm up the audience in getting into the right mood of the night. Next, she moved on with ‘Banana’ and ‘First Kiss’. Being able to converse in English does give opportunity for G.Na to greet her fans with ease. In proving she is more than the looks; G.Na did cover the medley of Rihanna’s ‘Take A Bow’ and ‘Rude Boy’ which shows her capability in singing. It is undeniable that this sweet woman loves her fans very much as she was so excited when she’s able to spot a group of her fans with the cheering board cheered for her from the crowd. Later, she performed her début song from the first album, ‘I Will Get Lost, You Go Your Way’ and then, Yong Junghyung joined the stage for the rapping part. With the funky outfit, 4Minute took the stage with a great energy in performing their latest single, ‘What’s Your Name’ and ‘Mirror Mirror’. These beautiful ladies greeted the fans and expressed their feeling over the overwhelming response from the fans. They even surprised to see the stadium full with fans who were singing along to their music as well as chanting to every line of it. They continued with ‘I’m Ok’, ‘Huh’ and ‘Music’. Hyuna announced that they will release a new song the day after and sang a little teaser for fans! To recap their stage, 4Minute sang ‘Heart 2 Heart’ while throwing the ‘heart gesture’ to fans and continued with the final song, ‘Hot Issue’. Beast came out the stage with ‘Beautiful Night’ and ‘Bad Girl’ before they greeted the fans. They received the loudest scream so far probably because the Beauty has been waiting for a long time after their last visit to Malaysia before. Yoseob mentioned about the hazy situation occurred Malaysia and showed his concerned by asking the condition of the fans. Although the weather was hot and hazy, the boys managed to give an awesome performance for their energetic songs such as to ‘Shock’, ‘Special’ and ‘Fiction’ before moving on with the ballad, ‘On Rainy Day’. Dongwon then, introduced the new song from Beast written by their member, Junhyung entitle ‘Will You Be Okey’. Malaysia Beauty can be considered as lucky since this is the first time they were performing the song live in the foreign country. They ended the show with ‘Sing to Freeze’ and ‘Beautiful’. 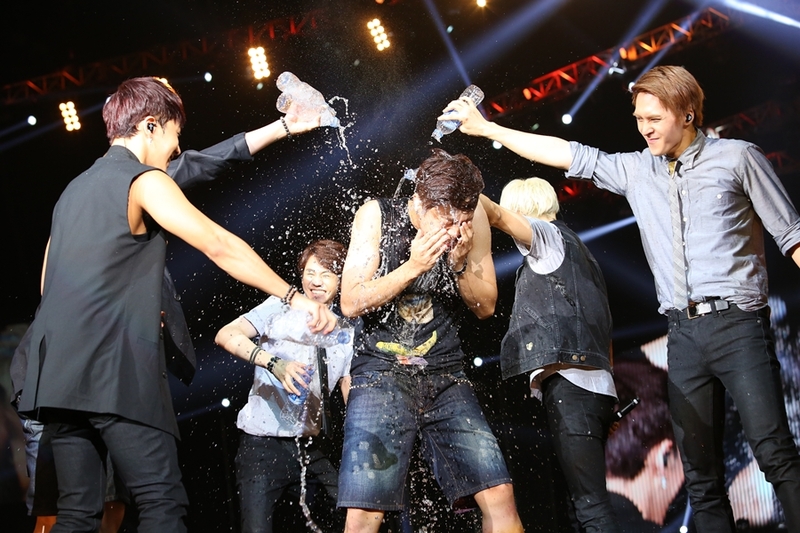 This is when the playful boys tried to be close to the fans by give extra fan service as they were running around the stage by splashing the water into each other. They also do not hesitate to throw the towel and t-shirt to the fans as well. As for the encore, they sang ‘V.I.U.’ and promised to comeback for a concert. We do really hope Malaysia will be listed as the one of the country in the list for the Beautiful Show Tour. 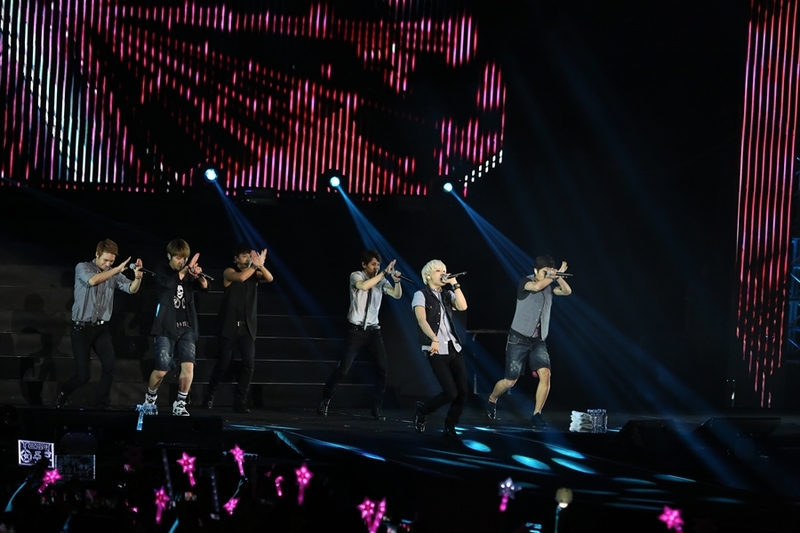 Overall, the Cube Family managed to grab the heart of Malaysia fans again through their music, songs and performance. Although this is the second time they were all here, their presence were really welcome by the fans as the crowd continuously cheered and sang along with them throughout the concert. We hope they are able to visit Malaysia again with a full scale concert as it is worth every-penny- spent in order to see them tonight.